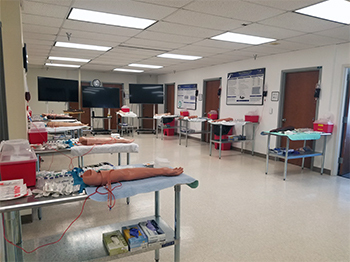 WISER is hosting the University of Pittsburgh School of Medicine�s 2nd Year Medical Students for their Clinical Procedures Course: Intravenous therapy. During the course, the participants receive didactic and hands on practice with IV task trainers on the techniques of starting a peripheral IV without the use of ultrasound guidance. Additionally, they receive instruction and hands-on practice learning how to draw blood. The class is conducted over two days to allow half of the students to attend on day 1, and they second half on day 2. With 150 medical students participating during the course, the set-up and supplies can be quit extensive. The images display the entire room set-up with 12 stations that are utilized simultaneously, with a close up on one specific station. Please join WISER is wishing the rising 3rd Year Medical Students good luck in their remaining last two years of Medical School.